For those of you that have had a very long and rough winter, this post is for you. This last winter started out early in mid November with January-like temps and lots of wind. I was thinking, Can I tough out the long winter when it starts sooo early? It did get a little better in the Midwest in December but alas back in the freezer for January to mid March. I ended up having a surprise surgery that kept me home bound unable to drive, lift and at times walking was difficult. I was hard to get along with and grouchy. I was not able to participate in the usual fun seasonal activities and even omitted putting up a Christmas tree. By mid January I had found a bit of a routine at home with television shows, You Tube, rented movies, podcasts and knitting. By the time I was due to arrive back to full time employment I missed my coworkers terribly and the patients that I knew so well. When there were three days left I started to get nervous. I am not a person that adjusts well to change, even if the change is an idea of mine. I had almost adjusted to being home and now I was heading back to join my life. At home here we did have weeks of cold weather that did not let up as usual toward the end of February. The cold kept on through mid March. There were many parts of the country that had bad weather-down in the Southern US there were cold temps, some snow and bouts of paralyzing ice. Out in the Eastern US there were feet of snow that fell. It seemed every few days they had another eight or more inches of snow. Through this entire time I thought about gardening and warmer weather. I looked at the seed catalogs, made lists and lots of plans. I made sketches of the garden beds and what we could grow. I watched videos on container gardening and hydroponics. I looked forward to crocus bulbs of spring and then to the tulips that would arrive. About this time every year there is a local festival- yes a tulip festival. Some years the tulips have been early and some years they are late. This year they are right on. 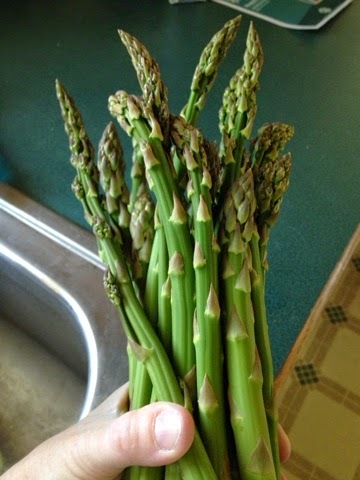 At about the same time the asparagus in our garden is ready to be picked. Today I went out and the above picture is my proof that those long dark days are over and the better weather is here to stay awhile. So for all of the people that have been yearning for better weather, hats off to you, and may you find your patch of asparagus.